The Welsh coast has several beautiful beaches. Rhossili Bay Wales is one such beach that offers spectacular views and freedom for everyone including dogs. This beach is recommended for the views and the winding walks along the cliff. A stunning beach that is accessible only via a set of steps. But when you get to the beach, you see that it's all been worth while. You find Rhossili Bay Wales at Rhossili, Swansea, SA3. Take the M4 and exit 42 onto A483. From the A483, you need to take the A4067, B4436 and A4118. Finally turn onto B4247 which gets you to Rhossili. 118/119 provides travel to and from Rhossili from Swansea. There are fast and frequent trains from many UK cities to Swansea. Trains from Swansea take under half an hour to get to Rhossili. You could consider a car rental from Barmouth town to use during your stay. Bunk bed with a catering kitchen accommodation at £135 a week. Self catering and sleeps 3 and costs between £250-580 for a week. Glamping holidays for a family four costs between £325-500. Self catering National Trust accommodation with 3 bedrooms, between £580-£1500 for a week’s accommodation. Ideal for a couple of families together. Self catering National Trust 4 bedrooms accommodation and costs between £1000-3000. 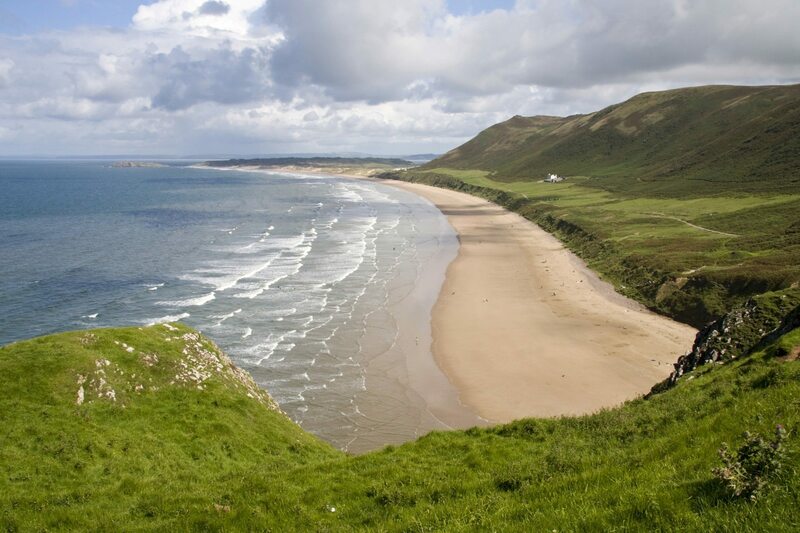 Rhossili beach is rated by Trip Advisor as one of the top 10 beaches in the world. So wouldn't you want to visit it? The beach can be accessed only via steps, so keep this in mind if you have accessibility requirements. For an active outdoor kind of family, there’s plenty to do including some whale watching and the falconry centre that charms visitors.